They said RSS was dead, but when Google decided to close the door on Google Reader, there was a vocal clamoring of disapproval. A flood of tools popped up to filled the vacuum left behind by the absence of Google's service and one that quickly grew in popularity is Inoreader -- thanks, at least in part, to the fact that it can be customized to look and work in much the same way as Google Reader. No RSS reader worth its salt would be complete without offering integration with a number of other online services of course, and now InoReader benefits from OneNote support. The addition of OneNote functionality means that it is now possible to share and organize the content you stumble across to Microsoft's note-taking tool. Before you get too excited, there is a slight caveat. In order to take advantage of this new feature you need to have either a Plus or Professional account. If you are puttering away on a free Basic account, you can try out OneNote support for a week by taking advantage of a free trial. The free trial gets a mention in an Inoreader blog post, but you'd be forgiven for missing it. To enable OneNote integration, hit the settings button to the upper right of the Inoreader page and select Preferences. Move to the Integration section and scroll down until you see OneNote. If you are working with a free account, click the link to commence a seven day trial and then click the Connect With OneNote button. 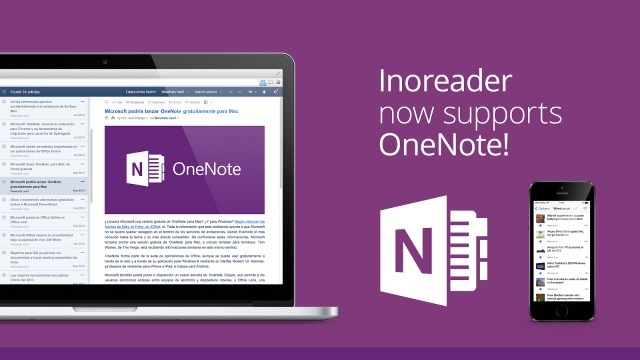 Enter your OneNote credentials and you’re good to go -- at least for a week! A new OneNote icon will now appear beneath articles you read, and when you click it the article will be saved to OneNote. OneNote is also supported within rules so you can define it as an action -- if articles match certain criteria, you can have them sent automatically to your OneNote account.